Recreate the wonder of the weather system with some simple ingredients – kids will be wowed by this cloud in a jar! This is the classic version of this experiment. If you’re doing the experiment with a group, it’s a great idea to have a jar per person and even more fun to create a label for each jar so they don’t get mixed up. To make a label, cut a rectangle from white card 6cm x 6cm. Decorate the border with a coloured pen, gems, glitter pens, or whatever you desire! Stick the word ‘Cloud’ in the centre using red self-adhesive stickers then write ‘My’ and ‘Experiment’ beneath it in pen, as shown. Fix the label in place to one side of the jar with glue dots or clear sticky tape. Add a cloud sticker to each corner of the label, as shown. Then it’s time to start the experiment! Make sure participants have a piece of paper and pen or pencil to hand so they can write or draw a description of what happens during the experiment. Fill the jar so that it’s three-quarters full with water. Then mix food colouring with water in a separate cup. Have several cups on the go, each with a small amount of food colouring and water in, so if you have more than one child experimenting with the same jar, they can each have a cup. Now create your cloud. Spray shaving foam on top of the jar, so that it sits on the water and ‘grows’ out of the top of the jar, looking fluffy like a cloud. Be careful not to spray too much or it will overflow over the sides. Now squeeze droplets of blue water into the cloud using pipettes or droppers. The drops will disappear into the cloud, but make sure children pay attention to what happens after - encourage them to keep their eyes on the cloud and what happens underneath. 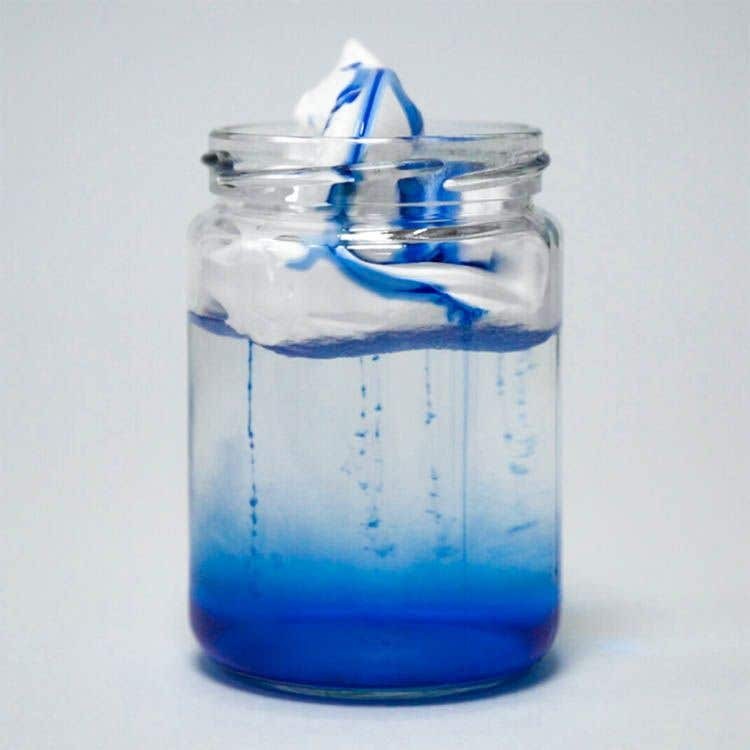 The blue water will sink through the cloud and come out the other side in blue ‘raindrops’ into the water of the jar, just like rain through a cloud! For extra activities, ask children to experiment with different amounts of drops, and to draw what happened when they dropped the colouring into their cloud.